Figure 1: Upstream Mend - The basic upstream mend is used when you must cast across fast water. 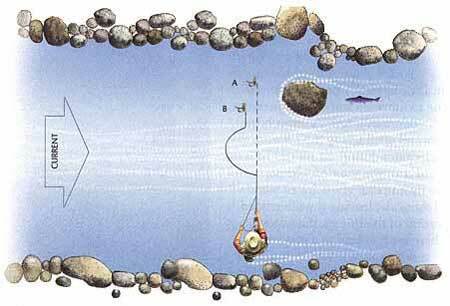 By throwing the line upstream, the angler delays the moment when the line starts pulling the fly downstream. The key here is to make the line hinge right on the seam between the fast water and slow water. MOST NOVICE ANGLERS think that the only hard part of fly fishing is learning how to cast: once you’ve figured out the old “10 and 2,” the logic goes, the rest just falls into place. It’s a comforting little myth — and it helps some people to justify buying a $700 fly rod — but things don’t really work that easily in the real world. A good friend of mine, who has been a guide for many years, always draws a distinction between those clients who can cast and those who can actually fish . (He maintains that the former outnumber the latter by a wide margin.) Casting only helps you throw the line through the air. But the fish don’t live in the air. They live in the water, and the water is usually moving. 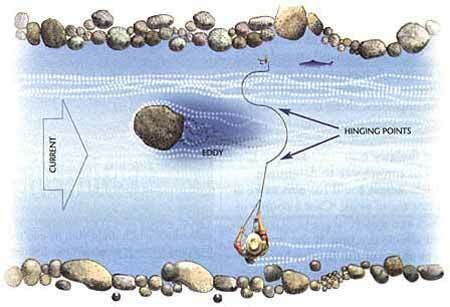 Figure 2: Double Mend - In this situation the angler is casting across an eddy (which will pull his line upstream) and fast water (which will push his line downstream). He will therefore have to make two mends. Always mend from far to near: First make the upstream mend, then the downstream mend. The key here is getting the line to hinge on the seams of the various currents. You can control the hinge point by how high you lift your rod tip and how much line you pick up off the water. The way to combat drag is by “mending” your line; that is, counteracting the effects of drag-causing currents by moving the line after it’s on the water. Mending is one of the least-understood aspects of fly fishing: many anglers are aware that mending is important, but they don’t really understand why . Mastering the mend requires good technique, as well as an understanding of river hydraulics and how they affect your line. The next time you look at the surface of a river, notice that the current is not uniform from bank to bank; different parts of the river move faster or slower than others. Problems arise for fly fishermen when they have to cast across currents of different speeds. 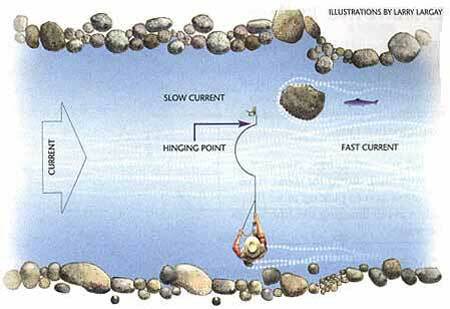 For instance, the current near the bank is usually slower than that in the middle of the river, so if you want to cast to the opposite bank from where you’re standing, your line will lie across the faster current, while your fly sits in the slower current. Because the fast current will take your fly line downstream ahead of the fly, the line will drag the fly behind it, creating a wake and ruining the dead drift. 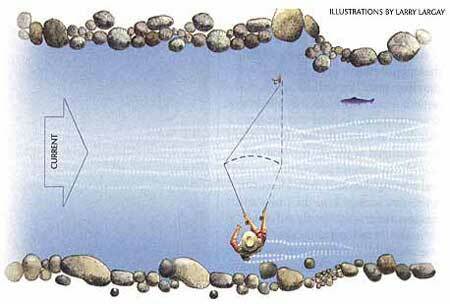 However, if you can arrange it so the line starts upstream of the fly, the fly will float naturally for as long as it takes the fly line to catch up to and then pass the fly. This is where the basic upstream mend comes in handy. Figure 3: Reach Cast - The reach cast allows you to throw a mend into your line before the fly hits the water. Cast directly across the river, and, just as the line straightens out, extend your arm and the rod tip upstream (or downstream, as the case may be). This will cause the line to fall diagonally across the current, which means that the fly has time to dead-drift before the line catches up. This technique works best in slower water and in deep pools where the differences in current are not very great. Figure 4: Drag Mend - In some situations, poor mending technique can be an asset. When you're making long casts across a fast current or when the current is really cooking, it's hard to make a big upstream mend without disturbing the fly. The solution is to drag the fly on purpose. First, slather your fly with a lot of floatant. Then cast upstream and beyond where you want the fly to be (A). Make a big, ugly mend, which drags your fly into the lane you want to fish (B). If you really lift your rod high and throw your weight into the mend, the fly should not sink. Unfortunately, the upstream mend is the only kind of mend that many fly fishermen ever learn, and they apply it to all situations. But different current conditions call for different kinds of mends. For instance, if the fly is moving faster than the line, you must mend downstream. In more complex situations, you may have to mend several times or mend different parts of the line in different directions. (See figure 2.) The important thing to remember is that you want your mends to do the opposite of what the current does to your fly line. The easiest way to determine which mends you’ll have to make is to not mend at all. Cast a couple of times and watch to see how the current affects the line. If the line races ahead of the fly, you know that you need to throw an upstream mend. If the line makes an “S” shape — with part of the line nearest you racing ahead and the part closer to the fly lagging behind — you know that you need to mend first downstream, then mend just half the line upstream. Once you get used to this idea, you’ll be able to read the water and figure out which mends are necessary before you cast. There are no set rules to how many mends, and in which direction, you can make during a single drift — as long as you don’t drag the fly across the water. An understanding of why you need to mend and how mending helps you achieve a dead drift makes the practice of mending a lot easier.